"At the end of forty days Noah opened the porthole he had made in the ark and he sent out the raven. This went off, and flew back and forth until the waters dried up from the earth. Then he sent out the dove, to see whether the waters were receding from the surface of the earth. The dove, finding nowhere to perch, returned to him in the ark, for there was water over the whole surface of the earth; putting out his hand he took hold of it and brought it back into the ark with him. After waiting seven more days, again he sent out the dove from the ark. In the evening, the dove came back to him and there it was with a new olive-branch in its beak. So Noah realised that the waters were receding from the earth. After waiting seven more days he sent out the dove, and now it returned to him no more." – Genesis 8:6-13, which is part of today's 1st reading at Mass. 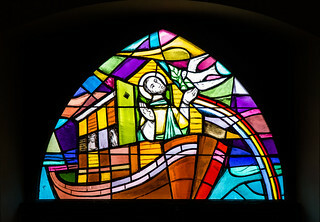 Stained glass by Émile Aebischer, also known as Yoki, a famous artist from Fribourg in the parish church of Gruyères. His signature is on the bottom left of the window.